Expeller pressed Grapeseed Oil is very light and delicate. This pale green carrier oil has a fine texture and is almost odorless, light in texture, and is easily absorbed by the skin, which makes it a favorite of massage therapists. It is a known anti-oxidant, protecting skin cells while it moisturizes and tones. 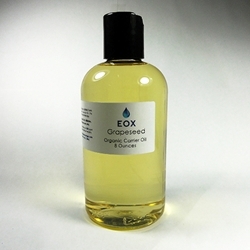 If you are concerned about nut allergies Grapeseed is the best choice, and it can be used as 100% of your base oil. Expeller pressed in detail: When Grapeseed oils are extracted using this method, the grapes are heat pressed to release the oil. There are no chemicals used in this process and it produces the best grape seed oil. Why use heat? There are no cold pressed grape seed oils despite what you read. Due to the small amount of oil in the seeds, a hot expeller technique is used. The only vitamin in grape seed oil is vitamin E. Fatty Acid content is below.